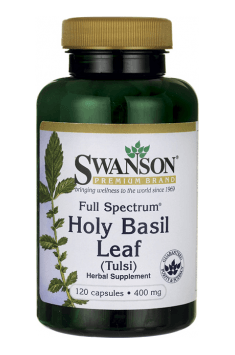 Swanson Holy Basil Leaf is a dietary supplement with leaves of holy basil, otherwise known as tulsi. It is a plant used for ages in Ayurveda and modern phytotherapy due to its anti-inflammatory, antimicrobial and body-strengthening properties. The recommended serving provides 800 mg of this raw material. Holy basil (Ocimum sanctum, O. tenuiflorum) is a plant species of the family Lamiaceae. Apart from leaves, flowers and fruit of this plant are also used in phytotherapy. Its effects are due to the content of many triterpene compounds (ursolic and oleanolic acid), essential oil and bioflavonoids (lutein and apigenin). Holy basil stimulates the immune system. It has been demonstrated that regular supplementation contributes to an increase in levels of anti-inflammatory cytokines, Th lymphocytes and NK cells, thereby enhancing adaptive and innate immune responses of the body and contributing to reducing inflammation. Such effects are due to the content of bioflavonoids in holy basil leaves. As polyphenols, they demonstrate natural antioxidant activity and thus have an anti-inflammatory i analgesic effect. Holy basil exerts antimicrobial activity. A high content of essential oil rich in phenols gives the plant antibacterial, antifungal and antiseptic properties. These compounds (methyl eugenol, eugenol and 1,8-cineol) have a bacteriostatic effect especially on harmful microorganisms – Staphylococcus aureus and Mycobacterium tuberculosis. Holy basil leaves have a topical effect on the oral cavity, consequently reducing inflammation and ulceration, supporting healthy teeth and gums and eliminating bad breath. Holy basil has a protective effect on the liver. Its hepatoprotective activity includes its stabilising effect on cell membranes and reduction in oxidative stress which can be induced by the metabolism of some heavy metals and toxins. Holy basil have synergistic effects with milk thistle. However, it is not recommended to take supplements with tulsi in liver failure. Holy basil supports the treatment of respiratory diseases. It may bring relief in angina, allergies or sinusitis. Due to the content of essential oil, it eliminates digestive problems, promotes metabolism and increases the secretion of gastric juice. To sum up, Swanson Holy Basil Leaf is a natural dietary supplement with a broad range of medicinal uses. It is recommended especially for digestive and respiratory diseases as well as bacterial and fungal infections, in the case of weakened immunity and low energy levels and also for individuals who lead a stressful lifestyle. Holy Basil Leaf 400mg 120 caps. Take two capsules two times per day with water. As a preventive measure or to boost the body’s resistance to stress, it is suggested to take regularly one capsule twice daily. In the case of long-term or frequent exposure of the body to stressors, the dosage should be increased to two capsules twice daily. Magnesium Malate supports proper muscle function, cardiovascular health and energy production. The complex composed of various forms of molybdenum. It facilitates the process of detoxification. Natural vitamin C in a powdered form. Excellent antioxidant, increases immunity and promotes health of bones.